Increases in inpatient care spending actually slowed in the 1980’s . Pharma/non-durable spending continued a slow climb then. But outpatient care spending doubled in that decade. Moreover, it seems responsible for most of the spending increases since. That’s my contribution. Who wants to dig deeper? UPDATE: I fixed some mistakes. UPDATE #2: Oops. Look like I misunderstood the question. It was not what happened in the 1980’s, but what happened in 1980. In that year, there was a big jump in sending/GDP in the chart Tyler linked to. 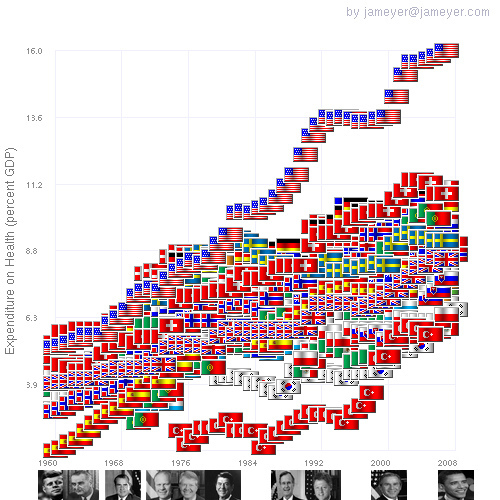 Since there was no great leap in health care spending that year (look above), it must have something to do with GDP. What’s the implication in saying outpatient care? Hospital stays have gotten shorter and much, much more intensive (procedures, acuity, studies) and work that previously was done inpatient is now outpatient (arthroscopies, etc.). Does location-shifting say much about overall costs? “ Spending on inpatient care. While some OECD countries have maintained a hospital-centric health care system, the United States has pursued policies to reduce the number of hospital days and inpatient admissions as a method of containing costs. Possibly as a result of these policies, per capita U.S. spending for inpatient care was less than inpatient spending in some other OECD countries. Switzerland spent the most per capita on inpatient care (curative and rehabilitative care and long-term nursing care), followed by Iceland and Luxembourg. 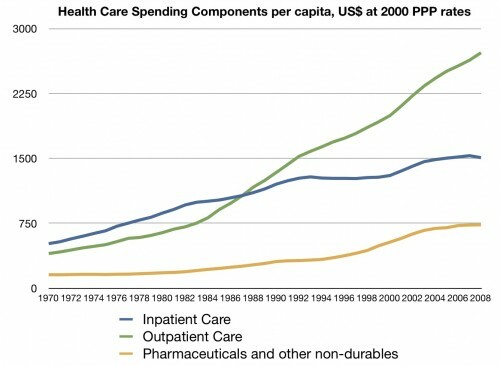 The United States was fourth in spending on inpatient care and virtually tied with Norway. However, U.S. inpatient spending was still approximately twice the OECD median in 2004. I can think of three major changes at that time that would have spurred spending, especially in outpatient care. Cat scanners had just achieved national penetration by about 1980. MRI scanners spread throughout the 80s. These two imaging devices were new technologies and they generated new procedures. This was also the time at which endoscopic/laporoscopic procedures began to proliferate. This was also the time at which angioplasties started to proliferate, but these were usually overnight cases. I do wonder if some hospitals were coding it as a short stay procedure making it an outpatient procedure. Let’s try this. The Pregnancy Discrimination Act of 1978 was approved 10/31/78 and became effective 180 days later. Most health plans (those with 15 or more employees)renewing after that date would have had to cover maternity expenses as any other disability. This might be enough added cost to show a large bump in 1980?